The Bishop name has carried out demolition works since 1935 in the London area and the Home Counties. James Bishop F.I.D.E. started his own business in 1958 after many years as a demolition manager for his father company, north London demolition. In the late 1940’s -1950’s he was in charge of some of the biggest demolition sites in this area including the demolition and clearance of some 200 houses and a large industrial estate that was cleared for the site of the 1951 festival of Britain on the South Bank. 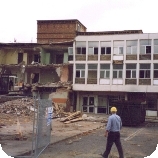 Under his guidance his family were trained in all aspects of the demolition, carrying out some specialist demolition works e.g. partial demolition of barrel roofs at three of the London’s biggest stations, Kings Cross, Liverpool Street and Paddington were executed. 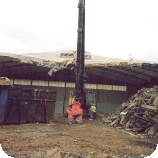 The company is fully committed to providing a quality service to all our clients using a fully trained work force and the latest technology available, culminating in successful demolition operations and satisfied customers. Our company have been a member of the National Federation of Demolition Contractors for over 50 years. Our company prides our self in recycling and reclaiming as much materials from our sites as possible, cutting down on costs to the client.